Each year the meetings of the China's Communist Party heads concludes with the same number - the number 8. Culturally it's an important number in China. 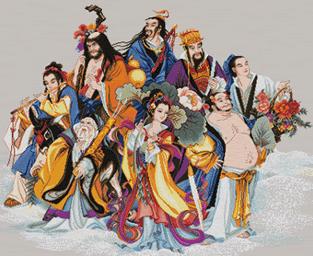 In Chinese mythology for example it represents the Eight Immortals. It is also consistently the target for China's GDP growth - year after year. The Party leaders have been convinced for years that 8% is the growth rate needed to prevent any major social unrest. As long as such growth is maintained, the people will not demand democracy the way they did in 1989. And it looks like China is on target to get to (or exceed) 8% again this year. In the past the growth was driven by exports. As the chart below shows, this year however exports are not keeping up with the GDP. So you start hearing stories about the domestic consumer demand all of a sudden picking up the slack. Hardly. The differential between GDP growth and slow export growth is picked up up by the government stimulus programs and tremendous domestic liquidity. As an example, take a look at this post/video on the Merrill Over Matter blog. This is what happens when central planning and corrupt politicians direct capital flows (as the asset bubble continues to build). Easy come, easy go. The goal is simple: maintain this growth rate by all means possible until the US consumer is back. That's why any concern about China refusing to roll their US treasuries positions is overblown. PRC needs the US consumer back in spending mood, in order to return to that export-driven growth (at least in the near-term). Keeping the funding flowing to the US and dollar rates low is key to get the export growth back to historical trend. Whether and when this will actually happen is another story.